It's very rare that I see Nora. She comes by only under the cover of darkness and only to eat. Unlike Pierre and Oliver, she's still super-feral. Saturday night I thought I might have seen her hanging out in the alley, but after further consideration I think the black cat I was seeing was a bit too big for Nora. 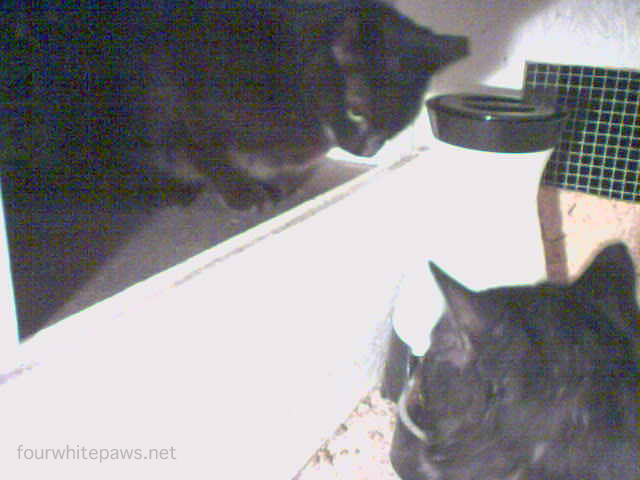 Sunday morning, for funzies, I checked out the saved images from the feeder cam and I found, two cats peacefully sharing the feeder! 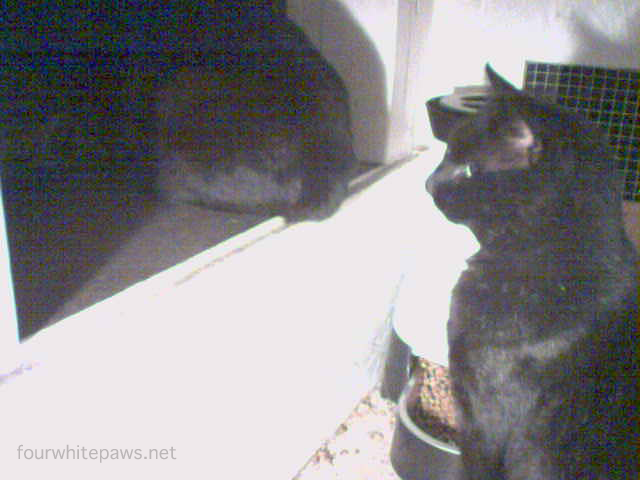 The only cats I've seen in the feeder together were Oliver, Pierre, and MK. But in this case, Pierre and Oliver were locked away on the back porch, so I know it wasn't them and MK is no longer with us. 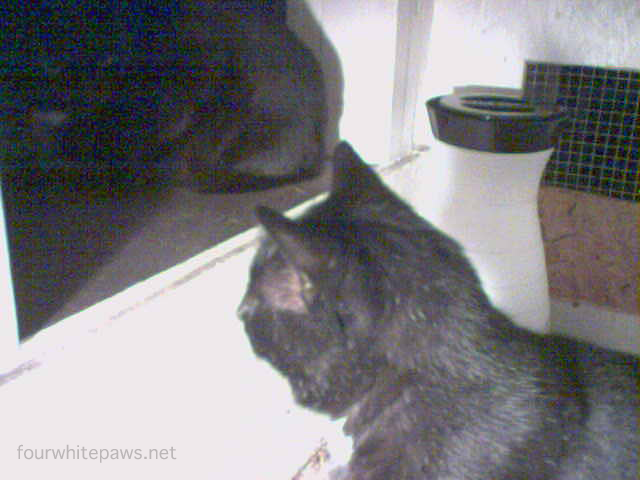 So then, who are these two black cats? So, who's Nora's friend? Maybe a boyfriend??? Maybe Oliver has a brother, and this is her uncle? Nora's pretty little face looks just like her brothers! I'm thrilled to see her doing well. I do wish she would learn to trust me and hang around more. I think it's time I take another go at trapping this guy... Meanwhile, I'm left to ponder why my yard seems to only attract black cats?! Weird. Nora, I am so glad to see you. For a bit there I was hoping it would turn out to be MK. 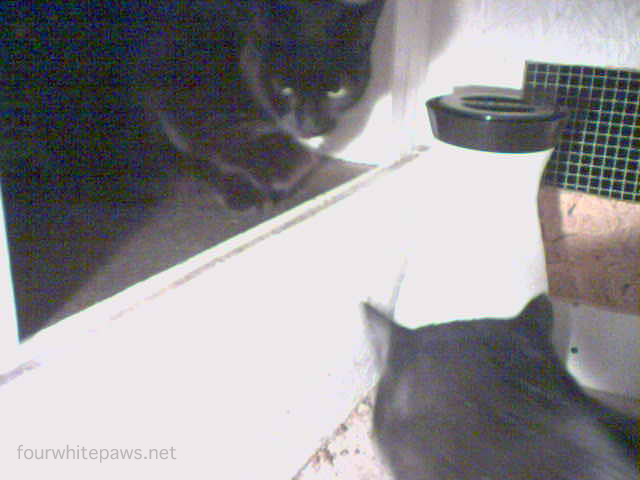 But whomever the other kitty is I am glad YOU are alright Nora. Nora is so pretty! Wish she would come around more often. Good luck with trapping the other cat. You are a very pretty gal sweet Nora! Nora may have a boyfriend, but at least we know there is no hanky-panky going on! It is weird that you have so many black ferals, so that family theory may be the reason. Good luck on your upcoming trapping expedition! Sounds like a boyfriend to me for sure. That is funny how you only seem to attract black cats. Maybe they have a sign posted somewhere on your property - "Black Cats Welcome." I know black cats have a bad rap that isn't true at all. So, it's nice to see someone trying to help the black kitties. I also was hoping one of them was MK. You are very proficient in the identification of black cats. Perhaps they are gathering for a Halloween party later in a few weeks. That is funny that you only get black cats. I am glad Nora is OK and I hope you can catch this other guy that doesn't have an ear tip- good luck. Oh it's so wonderful to see Nora, and her new friend. MOL We was gunna say sumfin' bout da black cats too. MOL They awe all so gawjus. Yous just attwact bootyful panfers.